The origin of smoked brisket in Texan cuisine and the dish’s eventual rise to near divinity have long been hotly debated. In 2014, Texas Monthly’s barbecue editor and smoked meat scholar Daniel Vaughn penned a well-researched and thorough history of brisket in Texas. According to him — and contrary to popular belief — the dish first entered the lexicon of Texan cooking in the early 20th century by way of Jewish grocers in west Texas. In the 1900s, that cut of meat was not only inexpensive but also kosher based on its location on the cow. So, smoked brisket was sold by Jewish grocers several decades before the smokehouses of central Texas built a culture around it. In terms of Houston’s relationship with smoked brisket, the dish was a late arrival to the city’s barbecue culture, one which was fostered in the historically black third and fifth wards. According to J.C. Reid, barbecue columnist for the Houston Chronicle, Central Texas brisket was not properly introduced to Houston’s barbecue scene until the ’60s and ’70s by popular smokehouses like Otto’s and Goode Co.
Today, brisket has usurped both sausage and ribs as the king of Texas barbecue, including in Houston. While the four regions of Texas still boast individual differences, smoked brisket is unquestionably the staple smoked meat from Beaumont to El Paso. 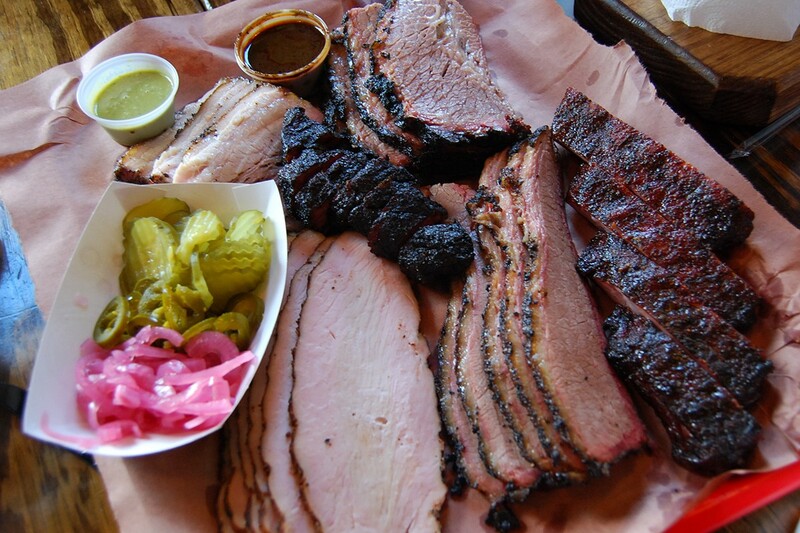 The following are our picks for the essential places to get a brisket fix in Houston. Blood Bros. BBQ, 5425 Bellaire: About five years ago, chef Chris Shepherd invited little-known pitmaster Quy Hoang of Blood Bros. BBQ to a barbecue pop-up in the parking lot of the now-closed Underbelly. The Vietnamese-American pitmaster wowed the crowd of foodies and chefs with a delightful brisket that incorporated an Asian spice blend into the bark. After working pop-ups for years with a portable setup, Hoang and his childhood friends, brothers Robin and Terry Wong of Glitter Karaoke, opened the first Blood Bros. BBQ brick and mortar in the Bellaire Triangle area in December 2018. Since the opening, the trio has enjoyed an unprecedented (and warranted) amount of gushing media coverage from outlets both local and national. While the praise covers the gamut of the creative menu, such as the smoked turkey banh mi green chili curry boudin, brisket remains the centerpiece. A black bark that thickens around the edges like peppered jerky hides a soft and unctuous marbled interior. The Blood Bros. brisket has been called too fatty by some, but exactly the resulting juicy, dripping qualities that keep us coming back for more. 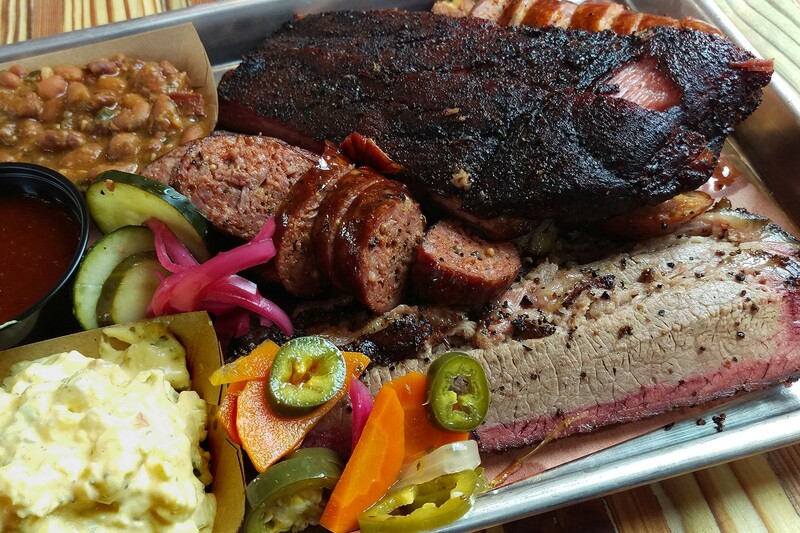 Barbecue platter from Corkscrew Barbecue. Photo by Scott Sandlin. Corkscrew Barbecue, 26608 Keith, Spring; Will and Nichole Buckman have been slingin’ some of the finest ‘cue in the state since before any of our inner-city picks were up and running. Barbecue is like that, after all; a rural tradition exported to the city. (It’s not that Tomball or Spring are exactly “rural” anymore, but you get our drift.) The Buckmans’ smokehouse in Old Town Spring applies indirect heat and red oak smoke to the briskets for up to 12 hours. 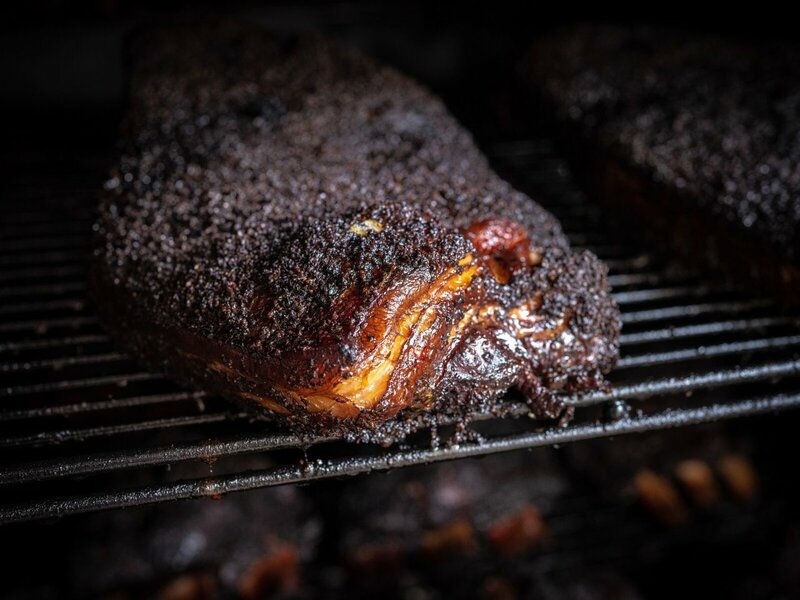 The slow-and-low brisket takes on one of the smokiest flavor profiles of any in the city, while the long cooking time creates a beautifully crusted, blackened bark with a pepper-forward bite. 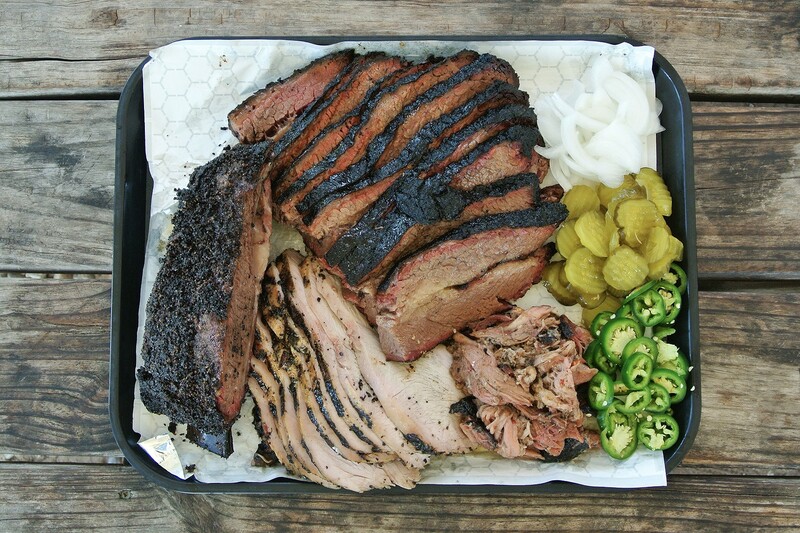 One of the first Houston area briskets to earn genuine respect west of Katy, this is a juicy, smoky and highly rated piece of meat largely recognized as a must-try among true aficionados across the state. Killen’s brisket smoking in the pit. Photo by Robert Lerma. Killen’s Barbecue, 3613 East Broadway, Pearland: Ronnie Killen is known as a local barbecue master, but surprisingly, his roots are in fine dining. 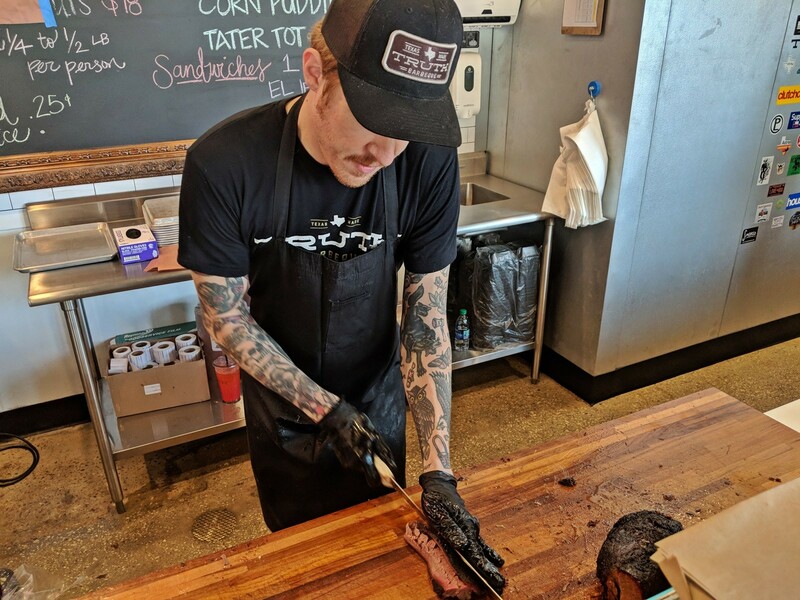 The Le Cordon Bleu-trained chef rose to local and then national stardom soon after the opening of his beloved Pearland barbecue joint, Killen’s Barbecue. The popular restaurant, once known for its three-hour long weekend lines, has spawned an ever-growing empire of Killen’s-branded restaurants, including a burger place, his original steakhouse in Pearland, a forthcoming one in The Woodlands and a new, barbecue-infused Tex-Mex restaurant, also in Pearland. In Houston, there’s the acclaimed Killen’s STQ — a sort of marriage of fine dining and smoked meats — and he’s soon also taking over the former Hickory Hollow spot in The Heights. 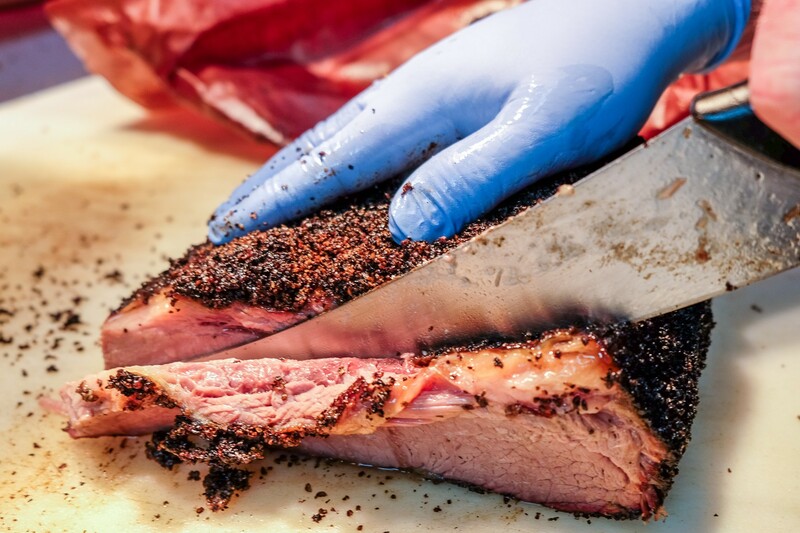 The secret to Killen’s now world-famous brisket is both in the quality of the beef and the unique dry rub ingredients. Locally sourced American Wagyu from Snake River Farms is slathered in Frenchy’s yellow mustard then covered in a mix of cayenne, sugar, salt and imported black Tellicherry pepper. The Killen’s brisket bark is among the best and shelters impossibly moist, fall-apart-tender beef underneath. Brisket, pork spareribs, and housemade sausage at The Pit Room. Photo by Scott Sandlin. The Pit Room, 1201 Richmond: This was Michael Sambrooks’ first restaurant in Houston, although he’s since been building a culinary empire. The Pit Room opened in Montrose in 2016. Though “ancient” by industry standards, where short restaurant lifespans are tragically common, the Richmond smokehouse is an infant by barbecue years. In 2017 the Pit Room was named one of the top 50 barbecue joints in the state by Texas Monthly, just a year after it opened. Starting with USDA prime beef and heritage Berkshire pork, it subscribes to the increasingly popular philosophy that better barbecue comes from better meat. 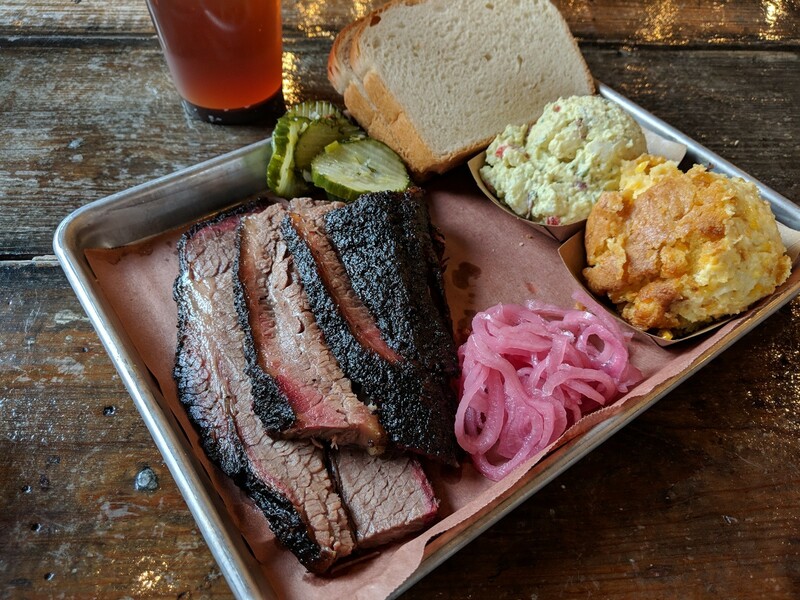 That puts The Pit Room at a higher price than what some casual BBQ customers are accustomed to (a common theme among our selections) but it consistently produces some of the most tender cuts of smoked brisket in the city. Russell Roegels slices brisket at Roegels Barbecue Co. Photo by Phaedra Cook. Roegels Barbecue Co., 2223 South Voss: One of the best aspects of Russell and Misty Roegels’ barbecue joint is that it’s actually within Houston as opposed to an outlying town. Another one of the best features is the brisket. Russell Roegels says that he’s currently using a Swift Black Angus Prime brisket seasoned with salt, pepper, chili powder and garlic. That’s a much more interesting and flavorful rub than the salt-and-pepper simplicity adhered to by barbecue purists. Roegels is also using one of the lowest and slowest cooking methods around. The briskets are smoked at 200 degrees for almost 24 hours, which achieves some incredible and thorough fat rendering. The Roegels earned at least one famous fan over the years. President George H. W. Bush’s Secret Service detail ordered the barbecue multiple times and Russell Roegel even had the opportunity to meet Bush before the former commander in chief died. In addition to the brisket, on Thursdays don’t fail to also get a Reuben featuring the remarkable pastrami and a Pastrami Beef Rib on Fridays. Any day of the week, it would be an error to not save some room for Misty Roegels’ excellent, creamy banana pudding with a healthy dose of real bourbon. Tejas Chocolate Craftory earns the top ranking of the Houston area joints in Texas Monthly’s Top 50 list, coming in at #6. Photo by Scott Sandlin. Tejas Chocolate + Barbecue, 200 North Elm Street, Tomball; How does a place originally named after its craft chocolates land the number six spot on Texas Monthly’s Top 50 barbecue joints? By serving some of the state’s most killer brisket and smoked beef ribs behind that unassuming name. When proprietor Scott Moore opened his craft chocolate shop in Tomball in 2011, he figured (rightfully so) that he should offer something to eat as well. With the help of his brother, chef Greg Moore, and business partner Michelle Holland, he picked up the art of smoking meat — a practice not unlike roasting raw cacao beans in his brick oven. Moore’s dedication to the craft of barbecue rivaled his commitment to making world-class, bean-to-bar chocolate and people started taking notice. The restaurant’s supremely tender brisket is made of high grade, well-marbled beef cuts smoked in an old-school, manual “stick smoker” that requires constant attention during the cooking process. The tasty brisket bark gets merely a simple salt and pepper rub and the beef is best accented with Moore’s unique mole barbecue sauce — made with housemade Tejas chocolate. Despite the old adage about not needing sauce for good brisket, this is one of the better sauces in Texas and a definite improvement to practically any cut of meat. 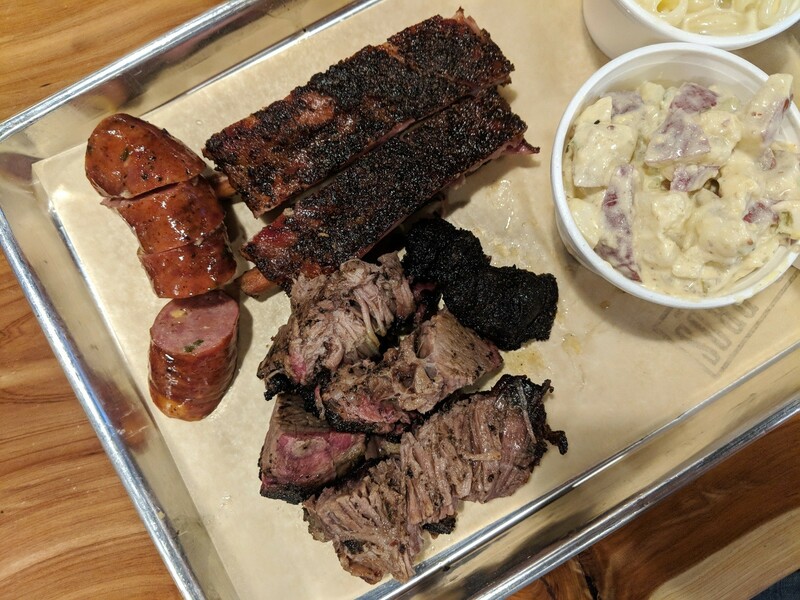 Truth BBQ, 110 Heights: In 2015, a young pitmaster by the name of Leonard Botello IV turned a used Klose smoker from Ohio and a roadside shack in Brenham into one of the best smokehouses in the state. His family-run operation soon made waves all over Texas, landing it the number 10 spot on Texas Monthly’s top 50 barbecue joints. The Houston location opened just this past January, after months of delays and much (much) anticipation. The Washington Heights store is significantly larger than its Brenham predecessor, boasting a beautifully designed interior and a large patio space that smells constantly of post oak smoke and beef fat. Truth’s brisket was famous before coming to Houston, and the daily line of customers that wraps around the patio is an indication that its popularity is only growing. Made with 44 Farms prime beef, and sporting a bark that’s more peppery than most, this is perhaps the most tender brisket in Houston. The phrase “melt in your mouth” is a sadly overused trope of food writing but in this case, it’s absolutely true. That’s thanks to a pitch-perfect rendering of the fat layers — and that’s harder to do than it sounds.